Ranjeet Banerjee is the Worldwide President of the Medication Management Solutions (MMS) business unit under BD’s Medical Segment. MMS is a global leader in medication management with market-leading product lines such as BD Pyxis™ (Pyxis ES, Pyxis IV Prep, Pyxis Logistics, Rowa), BD Alaris™ Infusion solutions, and the BD HealthSight™ platform for enterprise medication management. The mission of BD’s MMS business is to lead in delivering innovative solutions and value-added services that transform medication management to be safer, simpler and smarter. Ranjeet began his career with BD in 1995 as a Plant Manager and was responsible for the start up of the BD India plant. In January 2001 he relocated to Singapore serving as the Director of Operations for BD Asia Pacific, and in July 2003 took on the role of V.P. Global Operations for BD’s Medical Surgical Systems. In this role he led the development and execution of the low cost capability strategy for the global Medical Surgical business. 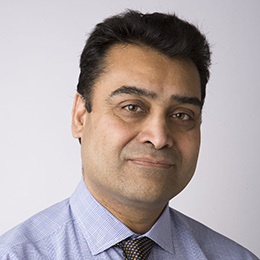 Ranjeet led the Global Injection business as VP/GM from October 2009 to September 2013, with responsibility for the Hypodermic, Sharps, Flush and Anesthesia Platforms. In October 2013 he assumed the role of Worldwide President of BD’s Diabetes Care where he was instrumental in leading the next generation strategy development for this vital business unit. Ranjeet moved into his current role in January 2015 and is a member of the BD Medical Segment Leadership Team. Ranjeet served on the Leadership Advisory Council of the Joint Commission’s Center for Transforming Healthcare (2013-2014), whose mission is to transform healthcare into a high-reliability industry. He serves on the Board of Directors for the California Life Sciences Association and the San Diego Regional Economic Development Corporation.